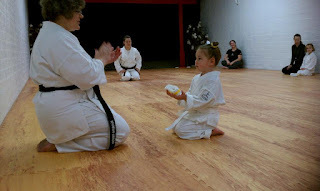 Fit Fluential Mom: Martial Arts for You & Your Kids! There are tons of activities to choose from when you're looking to keep you kids active & entertained. One of my favorites and definitely one of the most beneficial is martial arts. Not only does it keep kids (and adults) fit but it also teaches discipline, dedication & determination with its belt ranking system. Kids WANT to work harder and harder because they want to achieve that next belt. Most importantly, it helps with the ever rising problem called "bullies"! Bullies seem to be getting worse and worse and even more brazen. Getting involved in martial arts will help your kids defend themselves, not only against bullies, but also against anyone wanting to cause them any harm. Having said that, there are many choices today when it comes to martial art studios. They seem to be popping up everywhere. One problem.....they're expensive and some don't tailor their classes towards little ones. So, do research in your area and take advantage of FREE classes. Most studios will offer a free introductory class to see where your child is, if he or she is ready for the class and if you like the class for your child. I tried 4 different studios before I found the right fit for my daughter. Make sure to check out your local community's parks and recreation programs too! They're usually taught at the high end studios but at a portion of the price! Great msg for me, thanks a lot. Martial Arts Sydney enables you to learn and develop your skills.